Preparing students to be college ready, globally competitive, and engaged citizen leaders, our mission requires us to never create for today. For what are we preparing our students? The future. What is the future? How might we understand the future? What is emerging? How might we deal with the drivers of change? What are the disruptive shifts reshaping the workforce landscape? 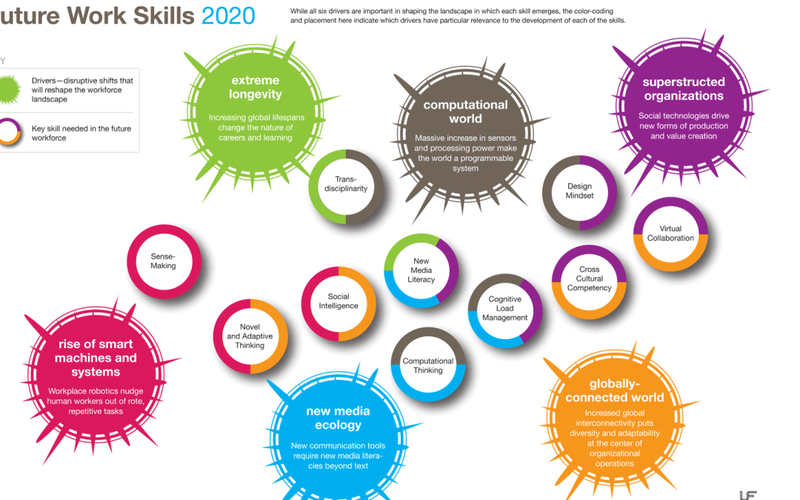 What are the skills needed to adapt, adjust to changing a workforce? What are the signals we need to be paying attention to and how can these signals forecast the future? I have more questions than answers, but it is important we look to research organizations as a means to position this generation for the future. The Institute for the Future (IFF) and the Horizon Report are great resources for companies/organizations/schools. As an exercise, take your leadership team and reflect on the Institute for the Future’s forecasting of Workplace 2020 or watch the Future of Coordination. How might we think differently? How might we never create for today? This generation of students does not have time for adults to catch up. It is time to do something.